I’m not a girly girl. I hate shopping with a passion, and consequently do as little of it as possible. Most of the clothes I wear to work are my older sister’s hand-me-downs, since she is much more fashionable and buys much better quality items than I do. My idea of a jackpot shopping trip is a visit to Kohl’s, where I run in, grab everything on the front racks, try them on in 15 seconds flat and buy anything that doesn’t look hideous. I do one of these maybe once or twice a year, at most. 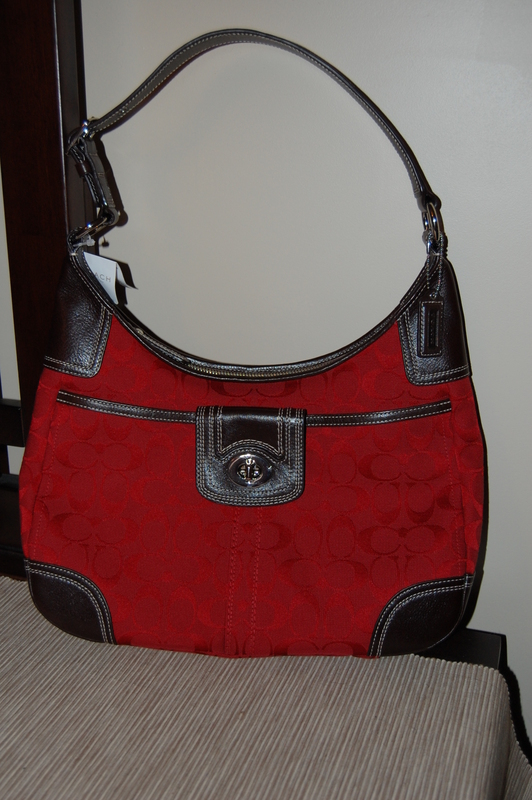 I put this on the Just For Fun list because I have never owned a purse that cost more than about 20 bucks. It’s just not something that interests me – purses, shoes, jewelry, etc, they all seem like a big waste of money for me. So, in honor of my anti-shopping snobbery, I decided to force myself to go into a Coach store when I was out of town on a conference and purchase a handbag that spoke to me. Increasing my crippling behavior in stores is my horrible indecisiveness and natural dislike of retail salespeople. In order to curb these two problems immediately, I befriended a salesperson and gave her a run-down of the “must-haves” and the “absolutely nots” of my purse desires. I must be able to, with one hand, pick up my purse and sling it onto the same shoulder without it catching on my elbow. If I have to assist with my other hand, it’s a no-go. It must sit on the area right above my hip, no lower, no higher, and I must be able to tuck my elbow comfortably into the side of it. The shoulder strap must stay up easily. I hate falling purse straps and bra straps. It must be big enough to fit the crap I like to carry around, but not so big that I will be murdered while digging for my keys in a dark parking lot. It must be a color, not a neutral like brown, black, or beige. No bright pink (thought bright orange or green would have been acceptable). No pasty pink either, for that matter. Ok, no ugly color in general. No hard leather. Not comfy for me. We ended up with two bags, one was a deep eggplant brushed leather and the other was a red cloth. I went with the red, after the salesperson convinced me I needed something “angry”. I’m not crazy about logo/signature ANYTHING, but this one was subtle enough with the barely-contrasting reds that I can accept it into my life. The leather is brown and I wear black almost exclusively, but Stacey and Clinton say brown and black go because they are both neutral, so I’m going to stick with the story of the What Not to Wear gods.